Jimmy the cat has an amazing party trick. And then the woman and a man are heard laughing as Jimmy obliges and sticks his 'thumb' up. Jimmy appears to have polydactyly, which means he has extra digits, a physical anomaly that's sometimes caused by a genetic defect. Polydactyl cats are fairly common in some parts of New England in the U.S. and they are sometimes called Hemingway cats, because the writer Ernest Hemingway grew to love them after being given a six-toed cat. Of course, it is always quite possible the incident was a fluke, or it's another internet hoax and the voices dubbed on the video afterwards, but it's more fun to assume it's genuine. 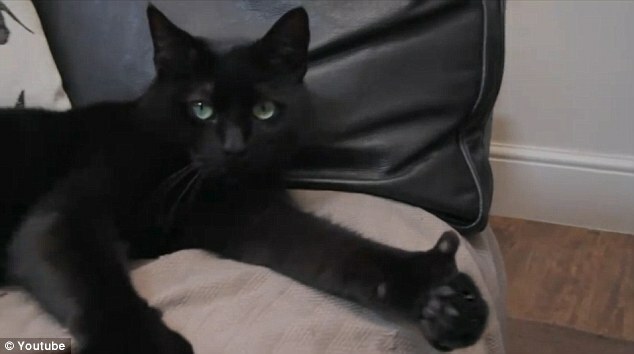 The Guinness World Record holder for the cat with the most digits is Jake, a cat from Ontario, Canada, which has 27 digits. The unofficial record goes to Bandit, a 29-toed cat from Hoboken, U.S. Bandit is owned by Beth Stuart, who is in the process of applying for recognition.